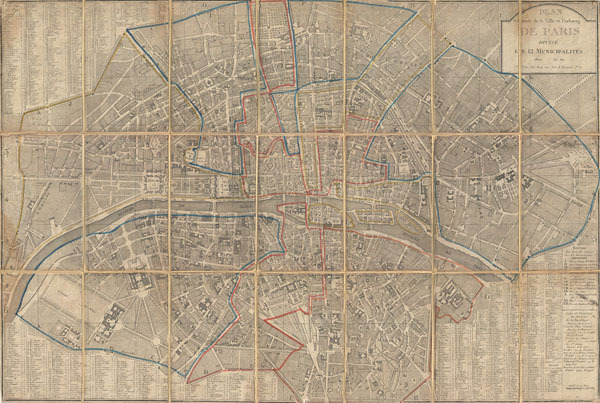 An ephemeral map of Paris showing Napoleon's division of the city into 12 Municipalities. Plan Routier de la Ville et Faubourg de Paris Divise en 12 Municipalities. An extraordinary map of pre-Haussmann Paris and the early Faubourgs (suburbs) issued in 1802, following Napoleon Bonaparte's 1800 reorganization of the city into 12 Municipalities. Covers Paris on both sides of the Seine from the Champ de Mars to Le Trone, extends north as far as Montmarte and south roughly to Port Royal. Produced at the height of French dominance of the cartographic arts, this maps is a fine example the engraver's art. Individual buildings, fields, streets, hills, valleys, orchards, and public gardens are revealed in breathtaking detail. We can even see the incomplete state of the northern wing of the Louvre Palace. There is an elaborate street index on either side and at the bottom of the map. In the lower right quadrant appears a list of names of the ministers in charge of the Municipalities. This is an update of a similar street plan made by the same publisher in 1797. This type of map, known as a Pocket or Case Map, is designed with the traveler in mind and while it display's beautifully unfolded, is designed to fold and fit in a vest or coat pocket. It accordance with its purpose, the map has been dissected and mounted on linen in 21 sections. This system was devised in the 18th century to protect folding maps against damage caused by repeated folding and unfolding. The linen backing absorbs the stress of folding and can easily be mended or replaced, this preserving the integrity of the actual paper document. Very good. Overall age toning. Some edge wear. Original linen backing. National Library of Australia, MAP RM 1378. Vallee, Leon, Catalogue des plans de Paris et des cartes de l'ile de France, (Bibliotheque Nacionale) 1644.